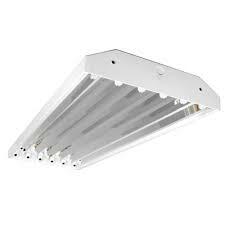 The FBHB Series T5HO Fluorescent High Bay lighting is used in Warehouses, Industrial applications, Commercial Buildings, etc. This T5HO High Bay is an enclosed back style made with heavy gauged white powder coated steel with hinged ballast compartments for easy access. Made with aluminum reflectors to achieve maximum light spread. 120/ 277 volt universal ballasts. 5 year manufacture warranty on ballasts. Lamps included. Accessories: Door, Wire Guards.